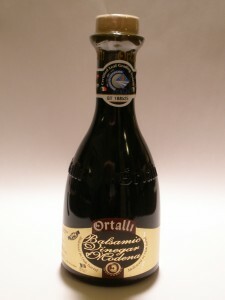 Ortalli Balsamic Vinegar Moderna - "La Vedetta"
This Balsamic Vinegar is on the sweet side. Along with the sweetness is a distinct sting on the tip of the tongue. The flavors are more pronounced and forceful. Use this if you want a stronger flavor that may overpower foods like fresh mozzarella. This has a much thinner consistency than other “Black label, 4 Leaf” Balsamic Vinegars I have tried. I used this to make a Balsamic Vinegar sauce to pour over chicken. This vinegar was cooked down with canned tomatoes and chicken broth. It was fantastic! The strong flavors of this vinegar worked very well in this type of cooking. Size – 8.45 fl. oz. Description – This comes from the beautiful castle and country estate owned by the ORTALLI family. This delicately balanced flavour and aroma make the product ideal for cooking. It is sweeter in aroma and flavour than the Cascina Palazzo, indicating a longer ageing of the product. Suggested Uses – Ideal for roasted meats and fish and for warm sauces. Sprinkling it on salads, soups, stew and pastas, using it to dress salads, along with olive oil, substituting it for red wine when preparing meat sauces, sprinkling it on strawberries. Just used for strawberry and marionberry jam. Fantastic! Sweetness of berries with the kick of the balsamic vinegar helps the fruit maintain the original sweet/tartness without the sugar overpowering the jam and making it bland. I swear it also appears to maintain the overall color of the berries even after cooked down. Am getting raves about the jam but not ready to give up the recipe yet!Look fforward to experimenting with this exellent product in the future. This is best Balsamic I have ever tried. Unfortunately I can’t remember where I bought it. I want to purchase more.